In the Pakistani capital, walls swayed back and forth and people poured out of office buildings in a panic, reciting verses from the Quran. 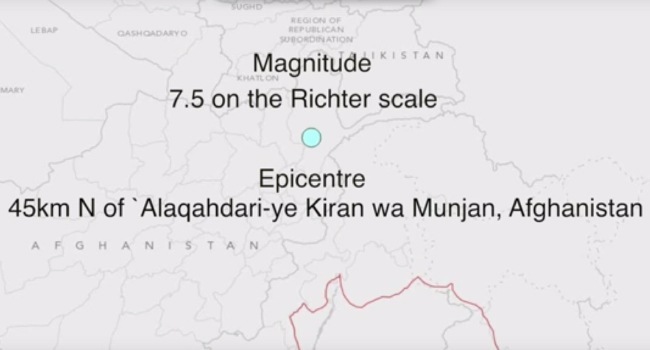 Vineet Gahlot, the director of seismology at the Indian Meteorological Department, said the earthquake had a magnitude of 7.5 and an epicenter deep in the Hindu Kush region of Afghanistan. The location has a population 666,668. The density of the location is 19/Sq Km, with 330000 in a radius of 75 km. The GDACS also states that the area has steep slopes (up to 90 per cent) and may be susceptible to landslides. Details of calamities, if any, are awaited. The full extent of the damage and the number of possible casualties was not yet known.